a gong that is well played." 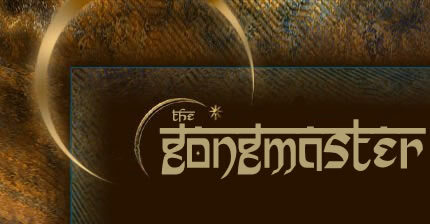 Sat Guray Nameh, Siri Guru Devey Nameh"
The existence of the Gong dates back to the Bronze Age, around 3500 BC. Evidence suggests that the Gongs existed at this time in Mesopotamia. Myth has it that sacred gongs included pieces of meteorites that fell from the heavens. Since the time of Buddha in 600BC, all sacred Chinese gongs have been inscribed with the two Mandarin Chinese characters "Tai Loi", which means "Happiness has Arrived", sweeping the darkness by bringing in the Light. 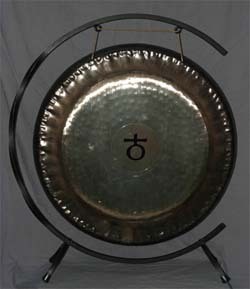 The gong ancient use was as an initiation tool for enlightenment, etheric projection and exorcism of negative spirits. It has also been used by Tibetan monks, and the Chinese, for centuries as an aid to meditation. There are instruments and there are instruments. 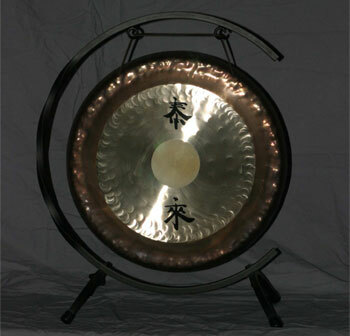 Among the latter is the gong, that instrument which can produce all the sounds within our hearing range. The oldest known gongs are over 5,000 years old and come from Asia Minor. In the East, this instrument has been used in many different religious contexts, for example, in yoga meditation. The West however, is only acquainted with it through its thunderous, yet seldom heard sounds in symphony orchestras. Paiste has taken traditional gong designs of the East and made a number of important changes with regard to design, construction and tuning. 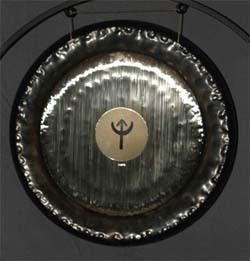 These gongs have been developed over the last 35 years in Europe by the Paiste company in consultation with scientists, musicians and therapeutic practitioners. The Gongs are made of a bronze. nickel and silver alloy which has been highly condensed through a process of heating and rolling under pressure. This process brings the metal to a consistency which carries minimal internal resistance and eliminates any possibility of cracks or fissures when used correctly. 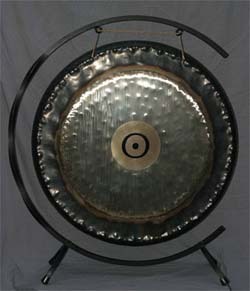 Gongs are tuned to create a harmonious blend of sustained resonance. 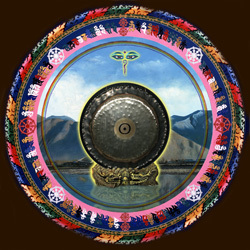 The Gong is like a stargate from which brings in a vortex of energy which facilitates our connection with the infinite higher self. Creating a synergy effect bringing the listener to know the oneness of all effortlessly, while recharging the body and strengthening the nervous system all at once. 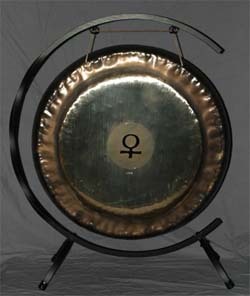 A Gong Immersion is like a very deep and lasting massage, by tuning the physical body and soul to the greatest possible resonance. played moving through the nervous system opening, clearing and recharging the whole mind, body and spirit. Triggering a meditation, contemplation state in which we have the opportunity to relinquish control of the mind. Negativity and chaos are suspended, irregularity and resistance are cleared, and the whole being is reset to a state of synchrony and alignment. "The Gong is the spirit song. It is the primal whisper of the soul. It's sounds is the echo of the Original Word that created the world, the sound within all sounds. Listen with outer and inner ears. Feel its pulsations and let the millions of vibrations dance and flow through your senses. You will become fearless, relaxed and awakened. The ancients sought this experience on the tops of mountains and at the sacred places. The voice of God would thunder in, spectacular strokes of lightning. The clap of thunder - Bang! Shatter! Roll! Echo! - stopped all thought, stripped away pretense, shook loose the deepest fears, and rejuvenated the nervous system. It created strength, peace and healing. The Gong is that sound. It is the flash of inner light. The mallet is the will of the infinite, the gong, the creation, and the sound is the spirit song, the heartbeat of the soul." 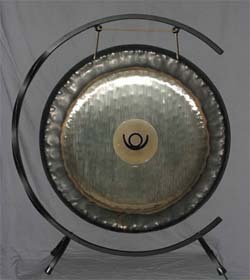 By SUNIAI (Deeply Listening) the Gong brings out the sound from were we all come from. When physical and spiritual bodies are showered with these sounds, they recognize their Mother-Father Creator, the vibration-sound were we come from. Just like a little lion cub when it is grabbed by it's mother totally relaxes. This parasympathetic system kicks in providing no resistance so the mother can carry the cub with minimum effort to a secure place. In the same way we are able to let go totally and all our systems reset to the default setting of the creator (the universal sound) bringing balance and harmony; helping us to relax, see things from a neutral point of mind, the state of SHUNIAA, removing the emotional traces of recurring Karma (the universal mind). One with the Universe. The lioness and the cub, the cub and the lioness are one. Experience SHUNIAA through the journey of the "Sotantar" which means going beyond time and space by tuning in to the frequencies of the gongs, listening, and feeling these sacred sounds vibrations. 1 - One way would be intuitively for whatever feels right to you. 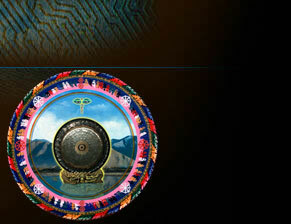 By listening to the 11 Gongs CD and find which Planet Gong sound frequency resonates most with you. 2 - By looking at the Solar System Gongs descriptions and keywords and deciding the areas that you would like to enhance or transform. 3 - By the ruling planet of your astrological sign or consulting your astrological chart. Named for the Greek Gods, the planets also embody significant archetypal, astrological and mythological association. Additionally, Sixth century B.C. Greek philosopher, mathematician, musician and cosmologist Pythagoras developed the concept of "The Music of the Spheres", the tone of each planet in our solar system coming together as one great cosmic chord. 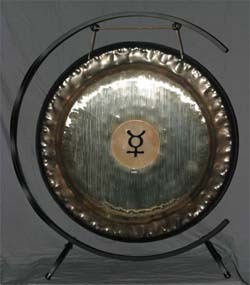 Solar System Gongs bring the harmonic convergence of the celestial bodies as pure sound energy. Enhances the perception of one’s own center, the magical and transcendental, is beyond all imagination bringing the listener into new dimensions and to a state where good and bad, shame and guilt, time and space, being and not-being are transcended. The SUN is a star and the center of our solar system - through its gravitational field and radiance all is sustained. The frequency of the Sun is based on a limit value - the threshold between expansion and contraction, as measured between the Sun and its closest farthest planets (Mercury and Pluto). Keywords: communication, intellect, clear mind, inventiveness, realism, perspective, creativity. Enhances communication skills through speaking, reason and writing. It is representative of intellect as well as the level of education and knowledge you are capable of attaining. Mercury energies enhance our ability to coalesce bits of information, connecting people and resources into new enterprises. Keywords: Union, art, gentleness, grace, completion, abundance, emotion, comfort, love. Enhances ability to feel and have love and close relationships with others. The sense of creativity and artistry, the ability to receive, share, and increase our love of pleasure, joy, harmony and self-appreciation and love. Venus frequencies work toward achieving balance - establishing interconnectedness - the force that joins - creative power. Enhances a new start. This is the time of beginnings and new directions, move toward desired goals. the New Moon cycle - this fundamental tone is 29.5 days. Together, these two time cycles define the Moon's movement in relationship to the Earth. The lunar cycles influence the ebb and flow of the tides, the balance of our bodily fluids and the energetic quality of day to day life. In times past, social and living schedules were planned around the natural movement of the moon. 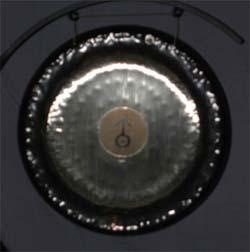 Moon gongs bring the resonance of the lunar cycles - as an experience in sound. Enhances major realizations concerning the goals established in the New Moon. This facilitates decision making through meditation and prayer, expect revelations. More energy is available for completion of goals. The Full Moon - the moon's orbit around the Earth. Fundamental tone is 27.32 days. Enhances an overall well-being feeling. Gently opening on the Spiritual and Physical levels. Letting go. Opening the Heart. The frequency of an Earth Day - 23 hours 56 minutes. 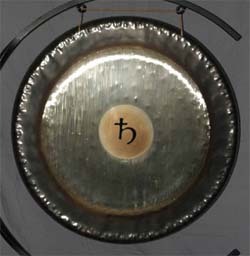 The tone of the Sidereal Day gong (G) acts as a tonic, is stimulating, energizing and recommended for use in the morning or at the start of any activity. Can be helpful in dislodging suppressed emotions or energy blocks. Keywords: Balance, strength, renewal, alignment. The Earth Year Gong brings us into harmony with the movement of the Earth and the traditional pitch (C#) of the original symbol "OM"
The tone of the Platonic Year (F) has a cheering and clarifying effect on the spirit. In Ancient China, it was the fundamental tone used for music and education - so as to be 'in accordance with the laws of nature". Keywords: Motivates strength, desire, action, restless, decisive, initiative, resolve, desire, excitement, energy, courage. Listening will enhance strength and desire. Will motivate action, bringing out decisions making abilities, gives courage, strengthens sexual nature, and drive to self mastery. Mars refers to directed energy, the need to build and accomplish. Motivates strength, desire, action. Listening will enhance strength and desire. Will motivate action, bringing out decisions making abilities, gives courage, strengthens sexual nature, and drive to self mastery. Keywords: trust, openness, good fortune, opening, affirming, patriarchal, fearless, faith, grace. ease. expansion. Jupiter can be equated with the spiritual master, who is said to give back nine or tenfold what he is given. Enhances concentration, focus and the process of becoming aware of consciousness. As well to be disciplined and persistent, and setting events with our self and others. Helps to be more structured and organized, taking responsibility and completing any tasks. Saturn is process, goals and perseverance - the wisdom gained from experience. Keywords: spontaneity, insight, life changes, freedom, revolution, clarity, creative focus, freedom, originality, adventure. Uranus is the planet of progress through ~ sudden realization, insight, ideas, discovery - adopting new perspectives. Keywords: imagination, mystical creativity, imagination, compassion, heightened awareness. idealism, mystical, movement, waves, spirituality and realization. Associated largely with artists and visionaries, Neptune agitates and animates the creative process - the sense of divine brilliance flowing through us. Keywords: Purging Darkness by Bringing the Light, Dissolving the Ego, Rebirth, Polarity, depth, potential, archetype, compulsion, catharsis. old - redefining ourselves, bringing the light. Sound description: The Sun Gong is a bell-style gong, it has a clear, resonant and long lasting tone which is free if splash or wash effect. 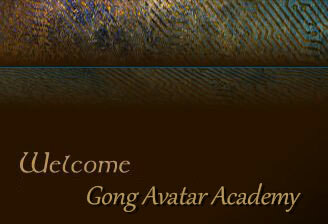 Sound Character: Vital, radiant and warm - the tone of the Sun Gong is naturally uplifting to the spirit. Reflector of the outer light. 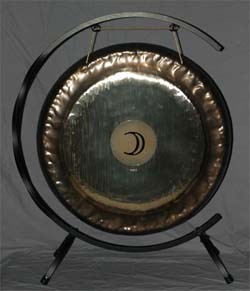 The Moon Gong, like its counterpart the Sun, is a bell gong. It is complex and other-worldly in its harmonic makeup, with a mystical ring that can be described as "calm and knowing". Sound Character: Deep, dark, feminine, enveloping, shielding. confident. forgiving. receptive, unconscious, Reflector of the inner light. Sound Description: The Earth Gong is alive and multi-layered. peaceful and wide with coarsely structured lows, swelling highs and a dissolving fade. Sound Character: Mysterious. knowing, remembering, strengthening, unfathomable, deep. 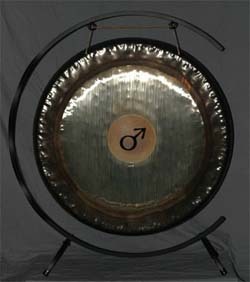 Sound Description: The Fire Gong has within it 2 opposing sounds - burning and cooling. Sound Character: Alive, active, heated and rising up I subdued, calm, cooled and resolved. Sound Description: Like its counterpart the Fire Gong, the Water Gong presents the polar extremities of water as a sound experience. from bell-like stillness to waves of harmonic wash. Sound Character: Unmoving, soft, quiet, soothing I flowing. swirling, bubbling, cleansing. Sound Description: Dynamic and responsive with a complex and exotic, raw tonality . Sound Character: Blending of complimentary parts within which there exists a dual character: conflict and resolve, excitement and calm, dark and light, male and female. Sound Description: Soft, understated. focused - round and full with a harmonious tonality. 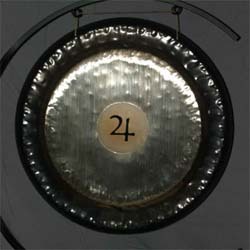 The Symphonic Gongs are tuned to themselves, they have a thinner construction than the Planet Gongs, creating a mysterious, expanding and harmonious blend of resonating tones. The Symphonic Gongs embody the fifth element: the ethers. Keywords: mysterious, powerful, pure, cosmic, radiating, impenetrable, kindly and wise.